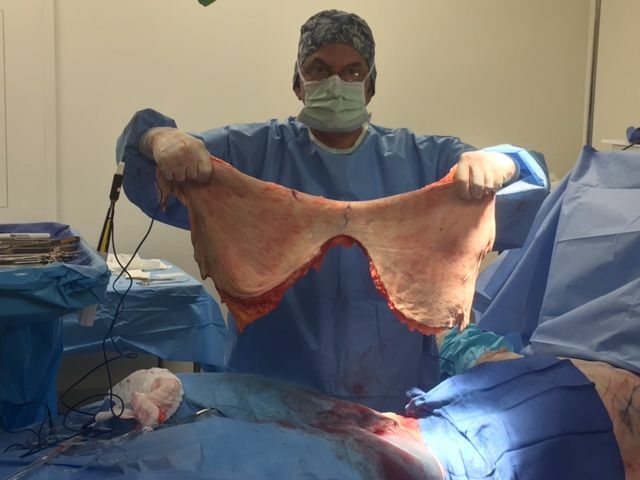 Blog Man Who Lost Over 300 Pounds, Dr. Thomas Trevisani removes Excess Skin. The following program contains graphic images that may be disturbing. Parents are advised that these images my not be suitable for young children. Zach, who lost over 300 pounds, is back to show off his new body after having his excessive skin removed. When he visited The Doctors, he had transformed from 460 pounds in 2014 to an amazing 150 pounds two years later following a gastric bypass. Zach was left an excessive amount of extra skin following his dramatic weight loss. With the help of plastic surgeon Dr. Thomas Trevisani, approximately 10 pounds of hanging skin was removed from his body. Zach is back with us to share his new body and speak about is amazing journey. Zach explains that he has had both a physical and mental transformation. “I have taken my life to the next level of happiness… we’ve changed our eating habits, I’ve stopped smoking. I have taken control of everything. I’ve lost 315 pounds, I’ve gotten rid of the skin. It is a brand new lifestyle,” he shares. When he looks in the mirror, Zach says he now sees a different person. “I see the gentleman that I was 10 years ago. I see the person that I was growing up and I am proud of myself… I am full of joy,” he continues. In addition to the gastric bypass, how did he do it? “I stopped eating fast food. I stopped drinking soda. I stopped smoking cigarettes. I cut all of that negative energy out of my life… we started incorporating good, smart foods. Lean meats, smart meats, we got rid of all of the dairy… box foods. We have a better lifestyle now. We’re more active and more energetic,” he tells The Doctors. Find out the amazing surprise The Doctors have in store for Zach and his wife Amber, who are celebrating their 10 year wedding anniversary, in the video below. I had 3 yrs ago a gastric bypass surgery. Now I want a body lift. I need a evaluation. thats great . I wish I could have some of my fat remove for free…..